The SPX finally broke out of the trading range between 1040 and 1105 and closed at 1115. A backtest of 1105ish would be nice followed by another rally to 1150. I don't know how you're feeling but this feels like Feb 2010, doesn't it? First, most had the 1-2-1-2-1-2 count which got changed to a 1-2-1-2 count later and then to a 1-2 count. 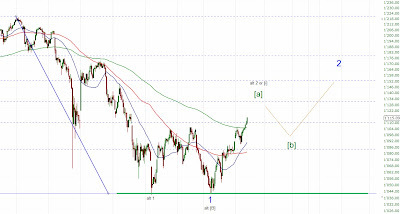 Then, in late February the market declined a bit and it felt like the confirmation of wave 3 down. As we know now this was only a correction and the market rallied another 130 points before it topped. Thus, the next decline should help to determine whether we go down or up in June and July. A three wave move down would be bullish while a five wave impulse down would be bearish. Preferred EW count is that we're in a wave [a] which should top around 1120 followed by a wave [b] to 1100 and then a wave [c] to 1150-75. Anything below 1040 is bearish and would confirm that wave 3 is underway.